How Has Chicago’s Coastline Changed Over The Decades? This stretch of shoreline — disheveled and industrial in 1931 — is now the home of the stately Columbia Yacht Club. 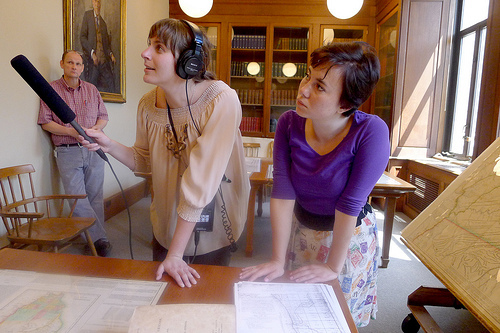 Reporter Robin Amer, left, and curious citizen Miriam Reuter, right, at the Newberry checking out early maps of Chicago. 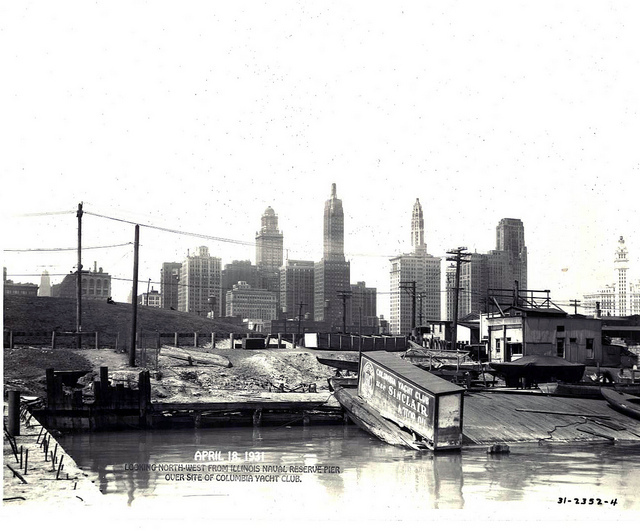 How has Chicago&apos;s coastline changed over the decades? The short answer to Miriam’s question is that Chicago’s coastline has changed a lot since the city was first incorporated in 1833 — so much so that in many places the city’s founders would likely find today’s coastline unrecognizable. And, it makes sense when you consider what the precious lakefront has been subjected to: it’s alternately been dredged and filled; it&apos;s been built up and torn down, only to be built up again; and caught in a conflagration, only to be graced by a World’s Fair that showed off a century of progress. The lakefront is, and has always been, a canvas onto which the city’s projected varying and competing images of itself. You can peruse some historic images and maps here — courtesy of The Library of Congress, the Chicago Park District and The Newberry — that document many of these changes. We hope Miriam finds them as satisfying as we do, but the whole story can&apos;t be laid out in pictures alone, so we dove into history and scouted for experts who can best lay out the why of how the lakefront&apos;s changed. It’s still possible to glimpse a few spots of “natural” lakefront — there are parts of Jackson Park, Rainbow Beach and some street-end beaches on the North Side that still resemble a natural state — but according to Chicago Park District historian Julia Bachrach, none is untouched. A pair of photos from the Library of Congress taken from around the turn of the last century, for example, shows beaches at Jackson Park and Fullerton Avenue covered with paving stones — the preferred treatment for beaches at a time when the lake was filled with sewage and few people swam. Even the ambulating curve of the lakefront’s footprint is largely a human construction. Chicago’s original coastline lay much farther west in many places, including downtown, where Michigan Avenue once abutted the lake. Successive waves of landfill pushed the lakefront east over the course of the last 180-some years. Bachrach estimates that more than 2,000 acres of land along the lake were built this way. And even that characterization, she said in a recent conversation, is likely conservative. You can argue that building out the shore with landfill was a necessity, dictated by the lake itself. “The city from the beginning had so many problems with lakeshore erosion that this reengineering was being done first and foremost to protect the edge of the city — not just the parkland but the actual built city,” Bachrach explained. Before it became home to the city’s business district, Michigan Avenue was home to the city’s finest mansions. In 1857 the city raided the Sands, evicted its residents and burned the shantytown to the ground. A little more than 30 years later, Cap’n Streeter’s boat marooned on the same sandy patch. He encouraged contractors to build nearly 200 acres of landfill there, which he claimed and named after himself. Eventually Streeter was run out of town, too, but the Streeterville neighborhood remains. One story that the pictures and maps tell is that, when we radically transformed the lakefront we imposed changing views of what&apos;s natural: Just compare Frederick Law Olmstead’s graceful, meandering landscapes, to the more precise and highly-organized Beaux Arts beauty favored by Daniel Burnham. Even today&apos;s wildlife habitats and so-called “natural areas” are created with a contemporary understanding of the term. Mitch Murdock manages the Chicago Park District’s “natural areas,” including roughly a dozen on the lakefront: the Jarvis Bird Sanctuary near Montrose Harbor, for example; the dune habitat at Osterman Beach; the Wooded Island and Bob-O-Link Meadow in Jackson Park. The dunes, for example, are carefully groomed to encourage the development of native plants, including the marram grasses that help hold sand in place. All the while, crews routinely purge invasive species, such as the highly adaptable cottonwood tree, which would overrun the landscape if nature were actually left to its own devices. Murdoch’s staff grooms trails to keep them both accessible and aesthetically pleasing (at least to us humans), and his department deliberately designs wooded areas by planting shrub masses close together and placing trees at a variety of heights. The goal: attracting migratory birds and birdwatchers alike. And although Murdoch’s team tries to recreate the kind of landscapes that once existed on Chicago’s coast, he acknowledges they favor certain settings over others. He outlined the various kinds of landscapes that existed near the lake before human intervention: dunes, prairies and savannahs, but also wetlands with their inlets, fens and bogs. That is, wooded bird sanctuaries may be popular, but is anyone clamoring for bogs? Not so much. ‘Open, clear and free’ . . . Forever? Miriam&apos;s question about how the lakefront&apos;s changed wouldn&apos;t be complete without mentioning the conflicts between preservation and development, which have varied between tussles and bare-knuckled legal and political brawls. The history&apos;s a good reminder. Current-day Chicagoans sometimes claim that the coastline has always been undeveloped, that we didn’t make the same mistakes that other cities did, namely allowing industry to crowd its coastline. Lois Wille, herself a Pulitzer Prize winner and the former editor of the Tribune’s editorial page, penned her definitive overview of the lakefront’s history in 1972. As she put it in a recent conversation, it was a time of a dozen small plans “to mess up the lakefront park,” including proposals to build a highway exchange over the Ohio Street beach and a concrete band shell in Grant Park — ideas that pitted city officials against preservationists and fans of green space. But disagreements about lakefront development predate any particular political fight that today&apos;s Chicagoans can actually remember; such fights have been around since the city&apos;s inception. Instead, the lakefront was set aside for public grounds, and the words by which that land was preserved — “forever open, clear and free” — have served as the rallying cry of preservationists since they were written — even if they only applied to that small stretch of land and the record of success is mixed. One of Chicago’s biggest early compromises with industry was the deal the city reached with the Illinois Central Railroad Company in early 1850s, the effects of which you can clearly see in the photographs and maps we gathered. To protect the city from the aforementioned erosion, the railroad offered to build a protective breakwater in the lake in exchange for development rights along the lakefront. The company subsequently built tracks on a 300-foot-wide strip along the lake between Randolph and 22nd Street, and created a rail yard on another 73,000 sq. ft. of land downtown. The ICR&apos;s plan proved controversial: Wille details how the deal was approved by the city council but vetoed by Chicago’s mayor. The council overrode his veto but reached a compromise of sorts. The ICR could build its tracks, but it could only do so on trestles out on the lake. That one decision has resonated ever since. The railroads “have been a blessing and problem,” said Wille. “We’ve been coping with it for 150 years.” Chicago became the nation’s transportation hub and then a commercial powerhouse; the city would not have become as important as it did without the railroad. But gradually the city has had to build around — and even over — the ICR tracks. The space between the rail trestles and the shoreline became a disgusting lagoon, filled with trash, debris and animal carcasses that floated down the river from the stockyards. After the Great Fire in 1871, rubble from the ruins was used to fill the lagoon, creating land now occupied by Grant Park. In 1912 the ICR depressed its tracks below ground and agreed to electrify its line to ease up on air pollution. And in the early 2000s the city covered a portion of the ICR’s rail yard by building Millennium Park. When I asked Wille if she thought the city had made a devil’s bargain with the ICR, she was surprisingly magnanimous for such an avid preservationist. So, Miriam&apos;s question&apos;s complicated for sure, but it&apos;s only partly answered by an account of how preservationists butted heads with the captains of industry ... or even how we&apos;ve applied different concepts of what&apos;s natural as we remade the landscape. This is Chicago, after all, and no answer would be complete without pointing out the obvious: Some residents got what they wanted, and others didn&apos;t. Any snapshot of the lakefront — or even the experience of the lakefront, like Miriam&apos;s own — is necessarily a snapshot of the city&apos;s politics. According to Wille, the outcome of proposed lakefront developments largely depended on the strength of the opposition. When City Hall&apos;s opponents were strong and well-organized, they won. Take a preservation drive that took place in 1965. In that incident, a group of protesters successfully stopped the city from extending and straightening Lake Shore Drive through the middle of Jackson Park by chaining themselves to trees. In other cases when opponents were scarce or weak, the council and the mayor were unchecked. That allowed City Hall to, say, turn Burnham’s Northerly Island into an airport and then give the airfield&apos;s operators a 50-year lease. Other examples include the construction of a convention center (twice, actually, as today&apos;s McCormick Place replaced the one that burned down in 1967), as well as two water treatment facilities on the lake — one north of Navy Pier and another at 79th Street. Politics and clout also led to the lakefront’s unequal development and maintenance, and as you&apos;d suspect, preservation victories were not spread evenly across the board. Kamin detailed such inequalities in his six-part series for the Chicago Tribune, which landed him a Pulitzer Prize for criticism. The series, completed in 1998, examined what he saw as the shamefully unbalanced allocation of resources between the North and South Side, white and black, rich and poor. Much has changed, of course, since Kamin dissected the inequalities between the north and south lakefronts and since Wille watched the city fight some of its most serious battles over open space; Burnham Park was beefed up, for starters, and Meigs Field was destroyed. But the struggle over Chicago’s lakefront will continue. “It will go on for decades and centuries,” Kamin said. In answering Miriam&apos;s question so far, we&apos;ve only brought up what&apos;s actually changed, but there was a lot more going on behind the scenes, and there&apos;s never a dearth of ideas about what do next with the lakefront. Just consider the number of fantastical plans that never came to be: Burnham’s plan for five islands instead of just one; Richard J. Daley’s plan to build four peninsulas and a 20-mile island off the coast (ridiculed by the press and his opponents as “islands in the sky”); a subsequent plan by Daley&apos;s son to build a grand stadium for the Bears right on the lakefront; the Santiago Calatrava-designed pedestrian bridge at Queen’s Landing; or the never-built monument to Burnham proposed for the Museum Campus. More recently, there&apos;s been talk of extending Lake Shore Drive north, visions of acquiring four additional miles of private land north and south of the city’s current holdings, and more concrete plans by the current administration to build new natural habitats on the site that Richard M. Daley bulldozed X’s into during the middle of the night. All this can give you pause. The stretch of beach that inspired Miriam&apos;s question may seem pretty solid and it may indeed remain as-is, at least for the rest of her lifetime, if not her dog&apos;s. It can seem solid, that is, until you consider what&apos;s already happened to Chicago&apos;s lakefront — even in the span of the city&apos;s short history. Correction: An earlier version of this story incorrectly listed the number of articles in Blair Kamin&apos;s Pulizer Prize-winning series on Chicago&apos;s lakefront. The correct number is six. WBEZ and Curious City would like to thank The Newberry for making its historic Chicago maps available for this story. Specifically we would like to thank the following library staff: Jim Akerman, Director of the Hermon Dunlap Smith Center for the History of Cartography and Curator of Maps; John Powell, Digital Imaging Services Manager; Catherine Gass, Photographer; Patrick Morris, Map Cataloger and Reference Librarian; Kelly McGrath, Director of Communications and Marketing. The Newberry is a partner of Chicago Public Media.